New Zealand Prime Minister Peter Fraser signs the United Nations Charter at San Francisco on 26 June 1945. New Zealand was a founding member and strong supporter of the UN. 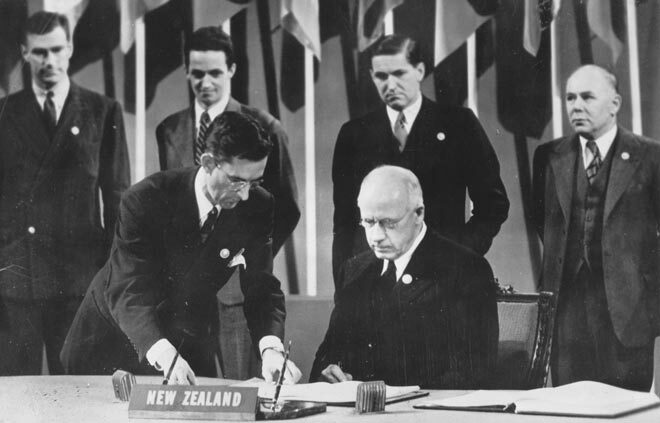 When the UN called for military intervention in Korea, New Zealand responded immediately – a move supported by both the National government and Labour opposition, along with the majority of the public. The fact that Britain, still seen as the 'mother country', committed forces to Korea was a strong incentive for New Zealand involvement. It was also hoped that New Zealand's willingness to take a stand in the fight against communism would encourage the United States to commit itself to a closer defence relationship.